If you’re looking for girl fun or mom and daughter time and want to explore NEW things…this show is for you! If you want to learn some awesome recipes and get in on some tasting too. This show is for you. If BLING is your thing…they’ve got it! If you LOVE to celebrate the beauty of cooler fall…and some pretty things to your home decor too. This is a must fun event for the ladies.But some guys come too. If you want to get healthier they have some educational and fun booths for you. If you want to get a makeover they have makeup artist from department stores waiting for you. Want a new perfume? They’ve got that too! If you want to see THE HOTTEST,LATEST kitchen GADGET or yummy find that’s sweeping the country get your ticket now. If you just want to browse or shop your flip-flops or sneakers off…please do! I have guest spoke for this show for years in Jacksonville and across the country and the wise and chic woman who started it knew exactly what we wanted! Thanks Joan!!! Now, to the best part I am guest speaking at the show again this year and hope if you live in or near sunny Jacksonville Florida I will see you there. The show is a month away…time to get your tickets and come out and play! If you live in Jacksonville Florida and plan on attending…reply and like this blog and tell me why you love this show! I am giving away a few sets of tickets FOR YOU and a BFF to the Jacksonville show…FREE! Stay tuned to my next SOUTHERN WOMEN’S SHOW blog! Want to meet a Real Housewife of the OC? Bring your BFF,mom sister or daughter.Come enjoy another year and another fun show! Jacksonville it is almost time! Show time at the Southern Women’s Show. Food,fashion,beauty and above all lots of fun! I will be there and guest speaking and COOKING UP SOME FUN on the cooking stage. Guess Who else will be there? Rock your hair with Michael O’Rourke famous educator and HAIRSTYLIST. Also if you are addicted to Real Housewives of any county like I am…You will LOVE what the SWS has in store for you. Vicki Gunvalson from the Real Housewives of Orange County will be there with her motivational show Tomorrow Belongs To You! She will also answer any burning questions you may have! Stay tuned for more Southern Women Show scoop and fun things you need to know before you go! Live in Jacksonville and want to win a set of two tickets? Respond to this blog and tell me why you love and want to go to the show! Recipes for Fall …from the cooking stage! What a great guest speaking engagement… days of pure GIRL Power and all things pretty and FUN bliss! 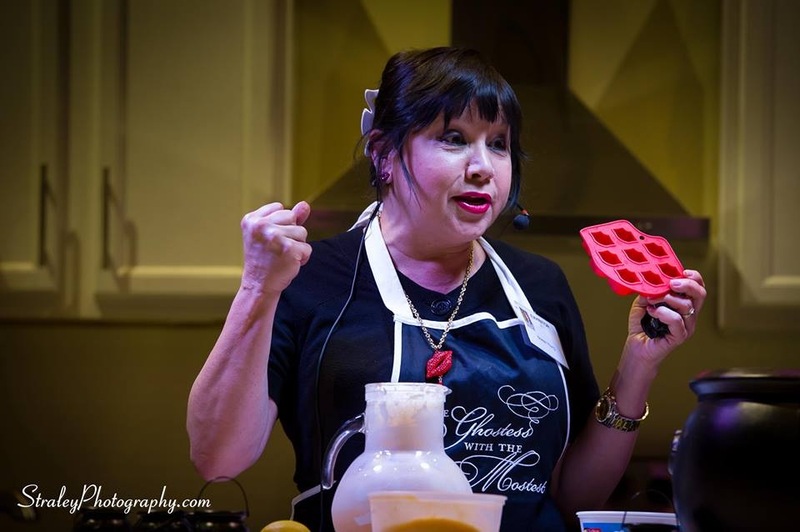 I loved guest speaking on the Celebrity Cooking Stage at the Southern Women’s Show. WOW ….it feels so good to be loved,liked,watched and hugged from the audience. Here are some recipes that I featured on the cooking stage I know you too will love to do. D.I.Y. Cheap & Chic Entertaining Ideas for the next few Holidays! To make your home smell AMAZING! I love the way my guests comment on how yummy my house smells. The aroma is so festive for all winter holidays. I like to add a dash of few pieces of all the above Place in water in sauce pan and cook on low. Your guests will love the fragrant aroma your kitchen will be infused with. Cheap, chic and easy entertaining. 2 bottles of gingerale1 1/4 cup of pineapple juice…add ice cubes. Mix all of these into a pretty punch bowl or large clear pitcher. Garnish with yummy mint leaves or orange slices. Add ice… My ice cubes are special. They are in the shape of adorable mini LIPS!Don’t you LOVE it?I love to cook and do makeup! NOTE: MY cooking apron reads the GHOSTESS with the Mostest. I made a HALLOWEEN punch stay tuned for that delighful and cool recipe your TRICK Or Treat party must have!